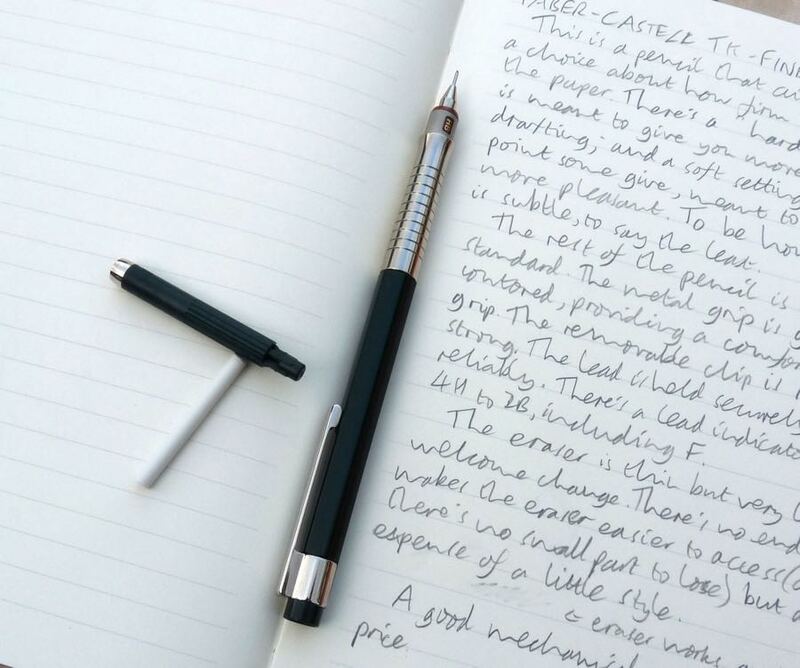 Faber-Castell TK Fine Vario L Mechanical Pencil Review – Pens! Paper! Pencils! 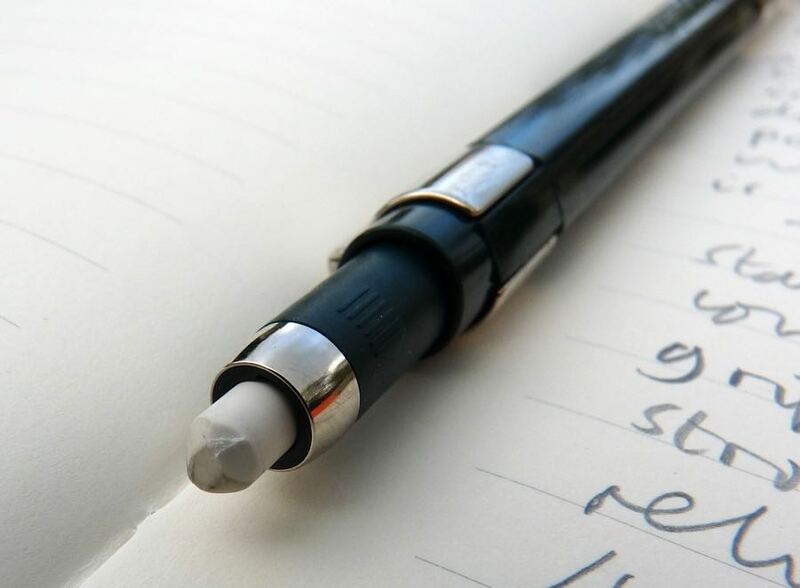 Mechanical pencils seem to be where companies are trying out new ideas, some of which are useful, some of which are gimmicks. 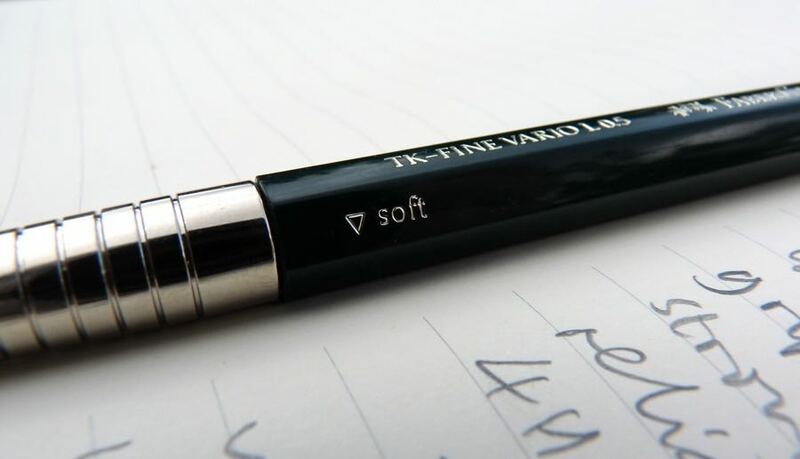 The snappily named Faber-Castell TK Fine Vario L features variable springiness to the tip. I was able to get this pencil at a discount thanks to Cult Pens’ support of the site. These are my own honest opinions. The pencil is made to a high standard. The plastic barrel looks great – Faber-Castell’s classic green and classy gold print and the long metal grip is contoured and grooved, making it grippy and comfortable. There’s a grade indicator between the tip and grip. It runs from 2B to 4H, including F. The lead’s held securely in the pipe. The clip is fairly strong. It’s a folded metal contraption used on the majority of mechanical pencils. It’s removable. The eraser works well enough and is very long, an improvement on the tiny little erasers usually found. There’s no end cap. This spoils the overall look of the pencil but adds a lot of convenience. It’s retracted or extended by twisting the end. This part pulls off to enable you to add more leads. The grip twists to a ‘hard’ or a ‘soft’ setting. 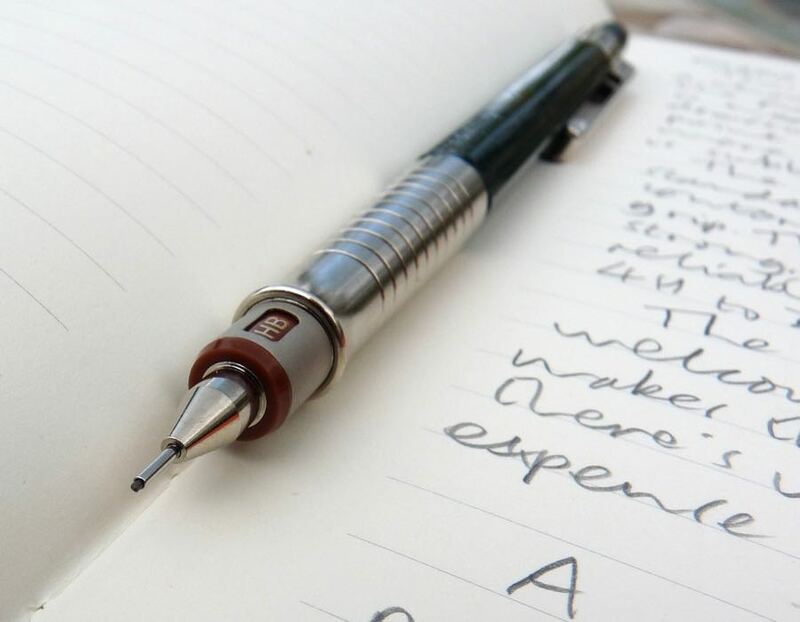 The hard setting is the one you’ll find in most mechanical pencils: the lead’s held absolutely firm. This is supposed to be good for accuracy when, for example, drafting. When set to ‘soft’ the lead is given some springiness: there’s a little give to it when you press it against the paper. This is supposed to make writing more comfortable. In use, the difference was subtle, to say the least, and, personally, I couldn’t see the point. Maybe I’m just not sensitive enough. I feel the hard/soft setting is a bit of a gimmick but the pencil itself looks good and works well. Faber-Castell make a similar pencil without this setting for less than half the cost but you don’t get the metal grip, which I feel puts the pencil into a slightly more luxurious category. Compared to other pencils, this is good quality and reasonable value even if you don’t find the hard/soft setting useful. 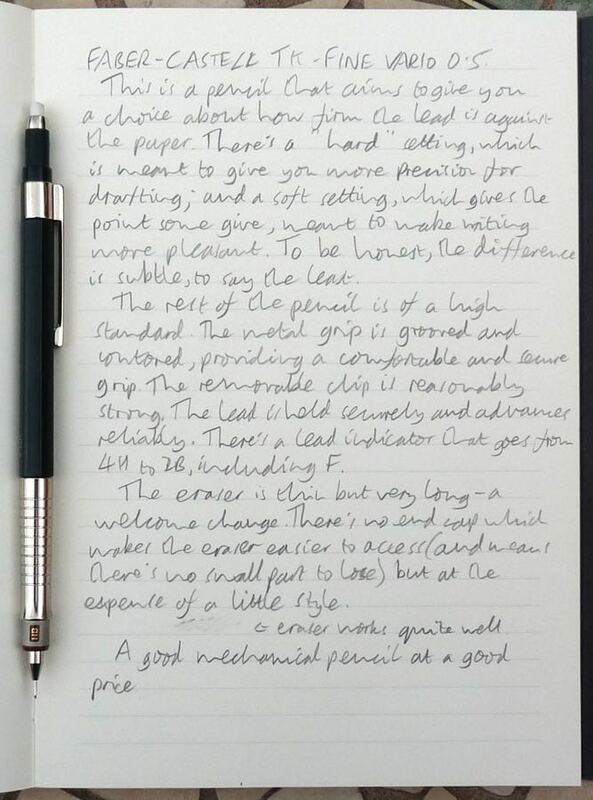 Nice review – I’ve eyed these up a few tmes, but never quite clicked “buy” – they’re certainly a handsome looking pencil! I do wonder about the lead indicator being below the grip – it would be hidden in a pencil slot, or a pencil cup, and seems like the only design element that’s not been thought through properly, at least to me. I’ve used the regular TK fine for years and decided to buy one of these just over a year ago. The eraser is a lot better than on the regular version. While I do like the feel of the metal grip I found it unbalances the pencil a little and I switched back after a couple of weeks. Maybe I’m just too used to the TK fine but now I only use the Vario XL when it’s the first thing to hand. Lovely pencil, just not for me.